There was a time when repairing one's undergarments was a task simply assumed would be done many times in the life of that garment. We've become such a throw-away society, that when something such as the wire in a bra breaks, it is now assumed the entire garment is ready for the garbage. Often times, there is much life left in that bra. It may sound simpler to just go out and buy a new one. But replacing a broken bra wire takes about 15 minutes, minimal sewing skills and will save you money -- that's money that you don't have to earn! Compare this to actually shopping for a new bra, which could take an hour or longer, be exasperating (trying on bras doesn't provide the same excitement factor of, say, trying on shoes) and cost $15, $20, $30 or more. Not to mention, the waste from a repair is minimized. One tiny sliver of wire sent to the landfill, instead of the entire bra. When something breaks on one of my bras, if it's not something easily repaired right then, I just tuck that bra in the back of the drawer. The usual problem is a broken underwire. I hang on to the entire bra, for the day will come, when another bra's wire will break. And then, I have two bras with broken wires. Just what I need. I can now scavenge a good wire from one of the bras, to replace a broken wire in the other. Here are two such "broken" bras. The wire broke on one of them about a year ago. I hung on to it. And lo and behold, the wire broke in another bra, just a couple of weeks ago (I only have three, so I was now down to 1 good bra). You know how it is with a broken underwire? You look lop-sided in t-shirts and other garments of somewhat clingy fabric. So, time to get to work and make 1 good bra from these 2 broken ones. First, I choose which bra will be the sacrificial undergarment. I cut a small slit in the casing, on the inside of the bra, which holds the wire in place, about 1/4-inch from the end stitching. The wire is fairly easy to pull out. 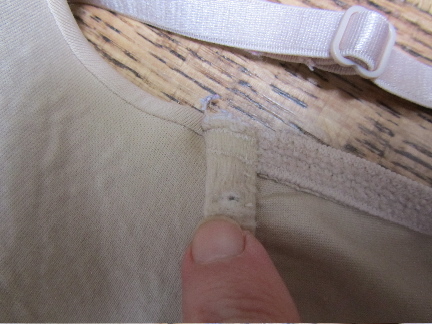 Next, on the bra to be repaired, I cut a tiny slit in the casing of the broken wire, on the inside of the bra, nearest the armhole, about 1/4 inch from the end stitching. I remove both broken pieces. The first piece comes out easily, but the second one sometimes has to be worked out (due to the raw end on the leading edge of this broken piece). I find it best to cut the slit about 1/4-inch from the stitched-end. It's close enough to the end, to make inserting the new wire a fairly easy task. But not right at the end, preventing the new wire from constantly trying to poke through new stitching. And I cut this slit on the armhole end of the casing, and not the center end. 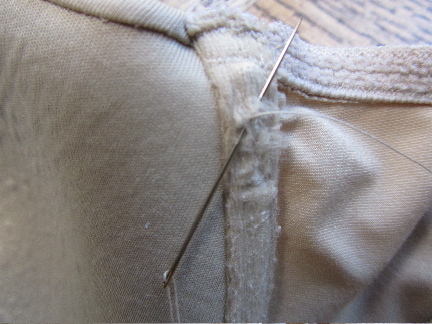 If the wire begins to poke out, after some time, it's much less uncomfortable nearest the armhole. Once the wire is mostly within the casing, I tug at the fabric casing, and slip the wire end into the remaining part of the casing. If the good wire is even a tiny bit longer than the wire being replaced, this can require some real tugging of fabric, or pushing on the wire end, to get the casing to slip over that last bit. For this bra, I needed to firmly push the wire end down, and into the casing, against a hard surface. (I just used the metal blade of my scissors, a concrete floor would work, as would a flat, metal, straight-edge ruler.) With just a bit of force, this was enough to stretch the fabric up and over the wire end. Once the wire is in place, I hand-stitch the slit closed. And that's it -- one good bra from two broken ones. The old bra (the one from which I scavenged the good wire) is still useful. I removed the broken wire, and now it can be worn around the house. When I find that I no longer need it at all, I will scavenge additional parts, such as hooks and eyes. 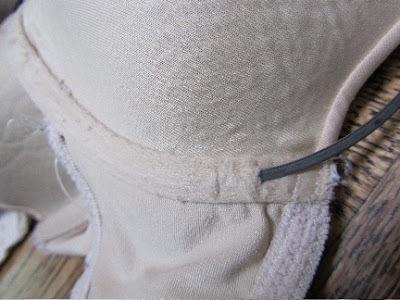 The eyes can be added to a stretched-out bra band, on the closure, to "shorten" a too-long band. And both hooks and eyes are great to add to my sewing notions, for use as closures on clothing (above the zipper on a skirt, for example). The padding in the cups can be used for craft projects (such as padding under appliques). 15 minutes of my time, and I have a functional bra again. Great solution! Easy fix, and you were comfortable! The problem I have had with underwire bras is not that the wire breaks--it's that it pokes through the material. When I try to sew it up, after 2 or 3 wearings it pokes through again. Oh, this has happened to me, too. That's painful! Here's what I have found and did. The reason the wire poked through the fabric on my bras, was that the enameled/rubberized end cap had worn off or was never substantial enough to begin, leaving a sharp wire at the end. I pulled the wire out about 2 inches, and put a new enamel coating on the tip (about 1/8 inch long, and covering the end well), with about 4-5 layers of nail polish, allowing to dry in between coats. This left a bulb-like tip on the end of the wire. Once totally dry, I stuffed the wire back in the casing. On 1 bra, I made a 1-inch long (and about as wide as the casing) patch of bias tape (it's what I had, and it's side edges are already turned under, and it's about the right width. On another, I used a piece of felt for my patch. On both bras that I fixed this way, I sewed the "patch" over the slit in the casing, with whip stitches, careful to sew right up alongside the casing, and not into the cup. It was well worth it on both bras, as both held up to many, many months of washing. Kris, the other thing I'll add is if the bra was a relatively expensive one, I would return it to the store where I bought it, and send a complaint email to the manufacturer. Here's my thinking, a manufacturer of a quality bra WANTS to know that something could be improved with their product. They know that word of mouth is huge with women. They'll use info like pokey wires to improve their product, so that their reputation can be restored. But this doesn't seem to be the case with lesser expensive garments. My daughter brought these beautiful bras from Soma, every on has a broken wire, I was on your site to see where to buy the wires. The solution they offered was she could send them back. No new ones, they aren't even old. She has 7 of them one for each day. She has had them 9 months. I was really disappointed with their solution. She hasn't sent them back yet. Oh how very frustrating for your daughter! Well, if she likes the bras, other than the wire problem, she can replace the wires herself. I was just looking at braessentials. com site, and she could buy either plastic or metal wires. They come in a variety of styles (plunge, demi, lightweight), so she could match her existing wires/bras. They're between 85 cents and $2.50 per pair, which is a somewhat cheap repair. I've replaced bra wires several times, now, if it's not too difficult if either of you sew, a little even. She might want to try replace the wire on just one bra to start, to see how it goes, and if she likes the fit. Anyways, good luck with this, and I'm sorry for your frustration. What did you use for enamel coating? I'm not as good as I should be about returning merchandise that doesn't stand the test of time, but you are right, the company will never know there's a problem if I don't alert them to it. I hate returning stuff, too. I just wait until I'm in a bad mood about something else, and then harness that energy to return faulty stuff. LOL! I solved the problem by not buying bras with wires. Now when I get rid of one, it is really worn out. I'm glad you found a solution that works for you! It's frustrating, isn't it? To have a half-working underwire bra. When I've tried to wear one with a broken wire still in the casing, it didn't fit right, and would sometimes be painful. I usually have the same problem as Kris - the underwire makes a hole and pokes out. I'll have to try applying nail polish before sewing it back up, thanks for the tip :) Bras are so expensive - it's good to get as much wear out of them as possible. I haven't had the pokey wire problem with this batch of 3 bras (all bought at the same place, same time, but 2 different brands). But before these 3, I stuck with one particular brand, because other than pokey wires, I liked the fit. Well, that brand seemed to routinely break through the fabric and poke me. I hope that they've solved their manufacturing problem. I did complain to their corporate offices. Have you thought about looking at a thrift store for a bra in your size, not to wear but to buy and scavenge the wires out of? Then you could repair both of your bras and not have to sacrafice one. And, bras that don't have much wear left are often very cheap at a thrift store but you don't care how much wear they have left, you just need the wire. Win, Win. That's a really great idea! And since I hang on to my "broken" bras, I can just take my time looking for one with good wires! Thank you! Hopefully, I'll be back up to 3 bras again, soon. Glad to help. I have been doing this frugal lifestyle for over 20 years and have learned a few tricks. But, I have learned that there is always something new to learn, too. And reading the writings of like minded people helps keep me on track. What an awesome idea! I have had a couple of wires break in bras before and just threw them away. I never would have thought of replacing the wire. The main issue I have with my under wire bras is when the wire pokes through the fabric and my bra becomes a 'cruel bra'. LOL! At first I threw the bras away when that happened. Then the frugal side of me quickly realized that I couldn't afford that. My Mom is good at sewing and a couple of times she poked the wire back in for me and sewed up the rip. Then I realized I could return the bras because I bought them from Kohl's and they have a no questions asked return policy. I have exchanged the bras there for new ones with no hassle. The Kohl's service rep said they just return the bras to the manufacturer. I always keep my bra receipts now. Kohl's is an hour drive from my home though. If I'm going to be in the city for other errands anyway, I will return the bras. I like your solution for pokey wires! And I happen to have moleskin here. For temporary fixes, I've just put a band-aid on the pokey wire, until I could get to repairing it. But I'll try the moleskin, the next time that happens. I can see how it would last through washings. That stuff is very sticky! I like the way that we're all finding solutions that work for us. We all come with different ideas and skill sets. Some of us sew, and that's great. But for those of us who don't sew, it forces us to be creative, and come up with alternative ways to solve these types of problems. Ooh, I like both of Angie's ideas! I usually get my bras from Kohls, too, because they often have good sales (sometimes they sell bras that are being discontinued for 70-80% off!). I will keep my bra receipts from now on--but the moleskin idea is great, too, especially since I hate sewing. Five years ago I splurged and went to Nordstrom’s for a bra fitting. Angela the lingerie manager was great. We tried several bras. I eventually bought two different styles. After wearing them a few days it was clear that one was a much better fit than the other. Angela had informed me that if my new bras weren’t comfortable I could come back until I get the right fit. This is a very generous policy but I think it is part of the reason why Nordstrom’s prices are so high. I really hate returning things, unless they are damaged, I’ve always believed that once I make a purchase the item is mine and I have to live with the consequences of my decision good or bad) With Nordstrom’s liberal return policy I conceded and exchanged the ill-fitting bra for a second one of the style that fit properly. I was given specific instruction about caring for my new undergarments and told I could expect the new bras to last a good 9 months. NINE MONTHS! Who can afford to spend $100 dollars a year on bras? Like I said that was five years ago. the bras are just now beginning to look a tiny bit worn. With your tricks I’ll get even more mileage out of them. I have never had a wire break but I've had them poke out. When they did I always just removed both wires, but now I know how to fix that problem too. 9 months! Goodness! Maybe they meant it would only have a like-brand new fit for 9 months. Kind of like you don't expect your jeans to look brand new a year after you bought them. Oh, if they only knew how long I make my bras last. My current set is going on 4 years now, and still provide a good fit and support. The band does stretch out over time, but I just start hooking it one eye over. I still have the last and tightest eye to go. When even that is too stretched, I sometimes sew on new eyes, just a half-inch in from the last one. I give up on a bra when the fabric on the sides develops tears. I mend small tears, but sometimes they get away from me. I know what you mean about abusing a liberal return policy. I have known people who really got good wear out of an item and then returned it. That's ignoring the spirit of the policy, IMO. But if something fails to live up to reasonable expectations, I do return it. I've never had a wire break - just the poke-age, which I've stitched up successfully in the past! Winning. I dare say that the dryer is at play, and I never use one? The dryer and washer are probably not at all good for underwire bras. When I go to take my wet clothes out of the washing machine, everything is one big twisted mess. Perhaps I should start hand-washing a few things! braessentials.com sells replacement underwires for a very reasonable price. Thank you. That could be very helpful info for some folks. Wow after reading all the comments I find that I'm in the same boat as Anonymous, several bras all with one broken underwire and I just got off the phone with Cacique's customer service and they could care less! So I'll deal with Cacique and their customer service with social media and I'll buy new underwires for my very expensive, not very old and in great condition bras and put them in myself!!! I have to say, I was so happy to see someone out there helping people with how to fix these issues. When I called Cacique, aka Lane Bryant it was just to ask if I could buy the underwires from them or if they could send me a few to fix my own bras, he was rude, told me it was time to buy new ones. I said I don't know about you but I don't just throw $50.00 bills in the trash can regularly if I can help it. It's sad because I may never buy another bra there again, I bought 4 new ones yesterday, but I may return them after this.